The topic of this week's list is in reference to Tom Felber's column "The Wwitt(i)girfoair Effect". The letter salad expands to "Wow, what is that? This unassuming game is really far out and rocks". By unassuming games, Felber means games like Qwirkle, Qwixx, Augustus and Las Vegas: the award-winners and nominees that many people like. Simple, but fun games. Considering I've always liked Qwirkle, Qwixx and Las Vegas have been the biggest hits for me recently and I just bought Augustus which seems quite promising, this is indeed a category I enjoy. So, which are your favourite games in this category? Since this list is about unassuming games, I'll keep it short, but feel free to add your favourites as items. Qwixx - what a lovely filler. A simple game of die-rolling. Easy to teach, some luck, some challenge. What are your favourite small box fillers that match these qualities? The big box filler. Something of a dreadful combo, really, putting a filler-weight game in a huge box. Augustus could do with a much better box. Well, it has some expansion potential, so perhaps that's one reason for the big box (not a very good reason, mind you). Any good examples of big box games that are actually interesting light games in hiding? Russian Railroads got onto the table with high expectations, as I had enjoyed the prototype quite a bit back in April. Luckily, it didn't disappoint - it is certainly one of the best worker placement games out there, even if the amount of options (and different materials/cards) is quite overwhelming at the first play. Lost Legacy turned out to be a very enjoyable microgame. Need to try it with more than two players as well. Circus Grandioso turned out to be a delightful little card game. Thanks to Joe Huber for pointing me in its direction! I'm still on the fence about Caverna. It seems to be the grand (multiplayer) version of the two-player Agricola: All Creatures Big and Small more than a direct successor to Agricola. I like the idea of your dwarves forging weapons and getting choices based on its strength; but I miss the sheer diversity from the Agricola card decks. Rampage continues to be pure chaotic fun . I had to miss Thursday games last week, but I played games with the kids and visited the Lautapelaamaan 2013 con, the brightest board game con in Finland. It's pretty small, but there was a decent selection of new Essen games to play and good company to play with. I would've chosen Russian Railroads as my headline game, but since Jeroen took that, I'll choose Machi Koro, which was another favourite of mine. Russian Railroads was my Essen checklist game #1. Fortunately there was a copy available in the library. It's a worker placement game about building Russian railroads. Nothing particularly new about it, so some people have not been thrilled by it, but I found it interesting. There's a good array of things to do, some tough timing problems and different strategies to pursue. The key is you can't do everything, and you must decide to skip something in order to score high with other things. My industry building got me a good start, but the other players built more track and hired more engineers, and I passed me badly on the last round. I'm not a big worker placement fan, but this game I enjoyed. It was a bit on the long side, we took over two hours, but that included some first-game fumbling with the rules, one slower player and the usual con disturbances, so I think a group of fast, experienced players should be able to finish this in 90 minutes. Augustus is bingo for gamers. Symbols are drawn from a bag, players put markers on cards by those symbols and when you fill a card, it's bingo! time. The cards you complete have different abilities, there's rewards for collecting particular sets and for the number of tiles you collect. It's a quick game, and quite entertaining. I'd prefer slightly more simple and clear graphic design, but otherwise this seems like a decent filler or family game, one of those marvellous games you can play with just about anybody in just about any situation. After lunch, madness. A Study in Emerald is Martin Wallace's game of a secret war between Restorationists and Loyalists in 1882 setting. Players control agents, trying to gain points, power and influence by deck-building, where cards are bought with an area-control subgame. The key to the lies in scoring. The two different sides have different goals, but membership is hidden. In four-player game, the teams are 2-2 or 3-1. The 3-1 isn't as bad as it sounds like, as the team with the lowest-scoring player is eliminated. The lone player needs only to be third to win, while the others must be first. Figuring out who's on your side is interesting, and so is the rest of the game. A lot of the game is in the secret war theme, and the game mechanics portray that well. If you don't care for that, the game has little to offer, just a bunch of ill-fitting parts. With the theme, everything comes together better, but it's still a pain to explain. I'm very much intrigued by the game, though. Anomia is another kind of mental disorder. This is a party game where you flip out cards with symbols and topics. Once two players show the same symbol, they must rush to mention an example of the topic in the other player's card. The faster player gets the card from the other player. Fun idea, because coming up with even easy answers under pressure is hard. This is a pretty good party game. Potato Man is trick-taking game with a silly theme, but with good ideas. There are four suits that are not equal. Yellow has the lowest cards and red the highest. There's an anti-follow rule: it's forbidden to follow suit. All tricks must have all four colours (in the four-player game). If that's not possible, the hand is immediately over! Highest card wins the trick and scores points by the colour of the winning card. Red is one point, yellow is four and so on. There are only three scoring cards in each suit. After they run out, you can get five-point scoring cards, even with red tricks. Potato Man is an interesting trick-taking game with a novel idea. Machi Koro is a Japanese game of simple city-building, the Settlers resource-production made a separate game. Players buy buildings that make money based on die-rolls. Some make money on your turn, some make money on everybody's turn and some make other player's pay you. The goal is to get enough money to buy all four landmark buildings. There are different approaches to this, which is nice for a small game like this. Machi Koro falls in the same excellent category as Augustus: very simple and very entertaining. Nations. I already wrote a review: Mikko's quick review: Nations Let's just say I'm not keen on the game. It hates me, so I'm loving it back. Nations (3p): A 5 is a very generous rating for now. I did not enjoy that play at all but that was partly self-inflicted as I made a few mistakes early on that took me out of the game and left me with about 2 hours of nothing much to do. Based on enjoyment alone it would have been a 3. Considering that the other players were new as well I'm not sure whether that's good or bad. I do know that I think the game is too long for the rather simple engine-building card management going on, though, and a 6 is the upper ceiling of what can be expected going forward. I'm not particularly keen on giving it another try, tbh. Mogel Motte (4p): Silly filler card game that is very dependent on the gaming environment (that includes players, clothes and seating). Nice idea but doesn't really work for me. Probably really better as a kids game. Taught a couple friends Bruges and we ended up playing four times over the course of two days. Canals are still tricky business, but I finally won using the canal strategy and even beat the "broken/overpowered" card...although I would have lost on tiebreaker if he had discarded a card for a point instead. I have now played this one 10 times and see new potential combos still...of course, whether you get the necessary cards remains in question. I continue to enjoy Patchistory after three plays. Both plays involved new players and both games with instructions went for around 4 hours. Hopefully, I will get a chance to play without new people soon and see if that game length can be decreased. I see Eric has played this one finally and didn't enjoy it nearly as much as I. For those who don't like the potential military beat-down in TtA and somewhat in Nations, I don't expect you to enjoy this one much more due to having to keep up with the opponents. I don't think the beatdown is as nasty as it generally takes a little while for an opponent to go to war, but they could potentially threat you every turn for 4 points if they have a trade route established with you. 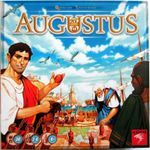 Finally got in a play of Rise of Augustus where the chips drawn did not reward a bum rush in brown. As a result, I won easily with my chariot/catapult strategy/synergy. Don't play Lancaster with only three players. This game needs 4-5 to shine and have the necessary conflict over the spaces. The game is too wide open with only three players. 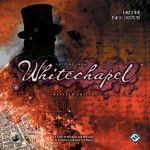 I normally enjoy London (first edition). This particular play was less enjoyable due to new people playing with no particular strategy in mind and people taking too long to make their decisions. A light week for gaming, as most of Friday and Saturday was spent at the Victory Point Games offices for business meetings. I did get to learn Old World New World, a nice filler game (but 1 play doesn't put it on this list) of racing across the map for 2-4 players. I played 2 players and got spanked, however it was by someone who had played a lot and apparently the game is best with more than 2. I also had a chance to playtest new designs by Jeremy Lennert and Chris Taylor (I). Jeremy's game is one where you (and up to 5 friends) are defending against wave after wave of incoming bad guys. Right now I have some issues with the components, however the game play seemed fun. Chris' game was a WWII air-fighting game with Allied planes against Nazi UFOs. It has a Wings of War feel to it, although with some different mechanisms, and could be a lot of fun. We also played a game of Machi Koro on a homemade set. This is definitely my sort of game and could also fit the "great filler" mold soon. Back home, 5 of us played 1830: Railways & Robber Barons. 2 were new players and at least 1 of them won't play 18xx again (that's not totally unexpected). The game was all night, and we were actually one set of ORs from the end when the shop closed. I did very poorly, partially because I was teaching new players, partially because one of the experienced players was going out of his way to make it difficult on me, and mostly because I mistimed the train rush. I thought I would get the last 5, but a change in operating order meant I had to hold out for a 6, and I would have had to withhold twice to do that, which in retrospect may have been the way to go. It's always good to get an 18xx on the table, though. Sunday was a catch-up day, although I did re-read the rules to Space Infantry and hope to get it on the table tonight. _8.7_ For the People: Last week I finished my ongoing game. My Union triumphed over the CSA in a completely ahistorical yet very fulfilling finish. The Rebs had a habit of not guarding their capitals enough, and General Grant fully sacrificed the East, allowing the Confederates to potentially raid four states while he himself snuck across the deep South over to Atlanta, where the third Confederate capital was placed. The SW loss for losing the capital in addition to a change of fortune deduction was enough to put the nail in the coffin for the Rebs. Lee soon pulled out of the East while Lincoln held a victory parade in the streets of a until-recently occupied Washington, DC (or something like that; the history books are a bit fuzzy). Anyway, I'm starting another game against the same opponent on Thursday. _10_ Chess: Nothing uusual here, but I do have one funny incident to report. One day, my friend and I were taking out a chess bag to play a few blitz games, and we realized that the bag had no board (the board was across in the room in the corner where we kept the bag). Before we got the board, though, an onlooker goaded us into playing with pieces but without a board. It was pretty hilarious considering that were still playing G/2 (2 minutes for each player). There were probably a few mistakes throughout the game, but overall it went extremely well. Unfortunately, I triumphantly proclaimed mate with five seconds left on my clock only to be told that the opposing king had another file to flee to. I soon flagged, but it was hilarious, win or lose. _8.6_ Paths of Glory: Let me preface this by saying that I'm a lousy Paths of Glory player. I love Paths of Glory; it's a great game, but I'm just not very good at it, and I am happy to lose repeatedly until I grasp the game (the concept of losing to get better doesn't bother me at all since I play competitive chess). Anyway, until last week, all my opponents (on WGR, since I could never get anyone I know in real life to play this game) had been seasoned players, but this week I played another relative newbie for the first time (I've actually played about 10 games, so I wouldn't call myself that new). Well, I had the Central Powers, and I took Sedan before reaching a total stalemate on the Western Front. France totally surrounded Sedan, but it couldn't do much to the entrenched defenders. The action thus centered on the East. The Russians invested in western Russia, but they left the north a little weak. This would normally be fine, except that I slowly crept in, destroying Russian corps along the way, and eventually put all of Russia OOS. It was possibly the funniest thing I had seen in PoG. My opponent resigned at that point. It was my first win in PoG, so that was nice. A couple days later I played the same opponent again. I once again had the Central Powers, but this time the Allies gained some ground in western Germany and captured Strasbourg. The Russians also fought back against the Germans in western Russia and retook Warsaw, but they couldn't quite capture Berlin. Italy entered the war at a fantastic time for the Allies, when I didn't have any armies on the border. Unfortunately for the Allies, he learned what happens when one gives Italy no support. Three Austrian armies charged into Italy immediately after the fall of Belgrade and plowed through the country, taking all the resource spaces. We had to adjourn at the beginning of T9. Shortly before we adjourned, Romania came in and the Romanians recaptured Belgrade, but it should be easy enough for me to take back. I didn't get to play any games this week, but I was at a gamer wedding! A friend with whom I used to play Star Wars CCG got married on Saturday, and she decided to add a little geekiness into the ceremony. The table were all named after planets in Star Wars, marked by their corresponding CCG card, and were arranged by their "parsec number" in the game--from Coruscant to Dagobah. I was at Endor; I was amused that the head table was a special location called "Rendezvous Point". The head table was shared between the bride, the groom, and a life-size cardboard Darth Vader, all of whom provided for lots of photo ops throughout the night. Instead of the traditional wedding music, the ceremony opened with the theme music to the Game of Thrones TV show, at which point Anni whispered to me, "Oh no, we're all going to die!" The bridal march was replaced by the medal ceremony music from the end of Star Wars: Episode IV (of course). She later told me they had the inside of the rings inscribed with, "I love you... I know." Fun times! _7_ Sail to India -- On Friday night my daughter and son-in-law were over and we were looking for a quick game to play. I suggested one of the new Japon Brand games that I got last week from Joe Huber. The first time I played it we got a rule wrong, but this time we got it right (if you move your ships, you can convert any of your ships to goods in that same action, as long as there's space on the card.) As I mentioned in my previous write-up, this is a pleasingly well-designed game, a quality I appreciate independently of the actual play process. You have a limited supply of cubes, and cubes do various things. If you want to accumulate money, you must put cubes to work as bankers---each banker can protect $5. If you want to gain VPs, you must put cubes to work as historians---each historian can record 5 VPs of achievements. So doing these things reduces your ability to do other things with your cubes. I'm not quite as crazy about it as some people, but I'm enjoying playing it so far. _7_ Russian Railroads -- I had played this game twice in prototype form, but this was the first time I played the published game. In a world where so many games have lousy rulebooks, this one has a rulebook that is a joy to read. It's as clear as can be. Now, my performance in this game is consistent---I haven't won or even made a credible threat to win yet---but I can see that there are a lot of interesting decisions. I have no idea whether it will be a long-term winner, but it certainly is fun for the first few playings at least. In our game, Brian Hanechak won by almost 100 VPs by pushing the southern line hard and fast and ignoring industry entirely. _5_ Machi Koro -- This has been getting rave reviews, so I really wanted to try it. It reminds me of Catan more than anything, with its mechanism of rolling dice to see what you activate. That's a risky mechanism for a designer to use, since there's a real risk of players perceiving as being too luck-driven but the wonderful trading aspect of Catan makes it work. In this game, where there's no trading, not so much. I felt this was all the bad parts of Catan distilled into one game. Now, it's so short that there really isn't much pain, but although I'd far rather play it than (say) Trajan, I'm not going to be seeking it out. _5_ Bluff in Zoo -- Not surprisingly, I have been working my way through a whole lot of new-to-me games recently. This game is somewhat similar to Liar's Dice, in that players in turn either claim something more ambitious about the stack of cards or doubt the previous player's claim. It's not bad, and in fact I think I like it more than Liar's Dice, but I didn't see anything special in this game. _4_ L'Aéropostale -- Our next game was this beautifully illustrated game about the dawn of the aviation age. Our group routinely learns games by tearing the shrinkwrap off the box and reading the rulebook. Joe Huber is good at doing this (I'm pretty good at it myself, for that matter,) and I've learned scores of games successfully by this method. We took the same approach with L'Aéropostale, but I and all the other players at the table (other than Joe) found it almost impossible to follow what was going on. 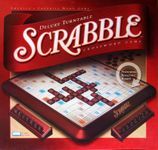 It's a game with a lot going on, so perhaps it's just naturally a game that requires a few hours of quiet study before you can teach it, but the words didn't seem to make sense, and we had questions that didn't seem to be answered. We then started playing, but only made it partway through before we gave up. Joe had a more favorable impression of the game and thought he'd enjoy it the next time, but I just saw that he played it again this weekend and found the work to teach it (given the poorly-written rules) more work than it was worth. After I posted my rating and comment on BGG, I got a GeekMail from one of the designers asking me to withdraw my rating, since I hadn't properly understood the game. He said I should learn the game from someone who knew it already (not something I can easily do under the circumstances.) I declined, because I think a game should be judged based on what is in the box. Now, if Joe manages to play it and speaks highly of it, I'll probably give it another try, and perhaps I will like it better. _5_ Patchistory -- This card game is clearly an attempt to create a more streamlined game in the mold of Through the Ages: A Story of Civilization, a game I love. Designing this kind of game isn't easy, and I'm well aware of the fact that if it were a little different, I might not like Through the Ages: A Story of Civilization at all. This game worked well enough, but toward the end, it became clear that the best plan for those who were strong militarily was to beat repeatedly on the weakest player. In Through the Ages: A Story of Civilization the weak player can withdraw from the game if this happens, and our game showed why that rule is necessary. _7_ Kohle & Kolonie -- Sometimes it takes a lot of looking to find games you'll enjoy, and as you can see from the list above, I was going through a bad patch, at least as far as my personal preferences are concerned. This game broke that streak. It is a game that is reasonably well focused and moved along briskly enough (at least with our group.) There are some things that seem a bit counter-intuitive (I'm not sure a turtling strategy isn't best in the long run,) but it was at least interesting to play. I'm not sold on it as a long-term favorite, but I'd play it again. _7_ Arche Noah -- My final game for this week is this cute little set-collection card game. Your goal is to collect sets of animals, with pairs of a kind of animal being worth positive points and any unpaired animals being worth negative points. It is played in "tricks" with 4 animal cards placed face up on the table for each trick in a 4-player game. You bid with purple chips (they look identical to the ones in 23) and draft in descending bid order. However, each player has 3 large green chips that allow him or her to take two animals at a time (so that someone will not get an animal.) I can easily see playing this game with non-gamers, and I told Joe that if he didn't decide to keep the game, I'd buy it from him.